And come they have, in droves. Since opening her L.A. restaurant, Lucques, in 1998, Goin’s cooking has garnered extraordinary accolades. Lucques is now recognized as one of the best restaurants in the country, and she is widely acknowledged as one of the most talented chefs around. Goin’s gospel is her commitment to the freshest ingredients available; her way of combining those ingredients in novel but impeccably appropriate ways continues to awe those who dine at her restaurant. Her Sunday Supper menus at Lucques–ever changing and always tied to the produce of the season–have drawn raves from all quarters: critics, fellow chefs, and Lucques’s devoted clientele. 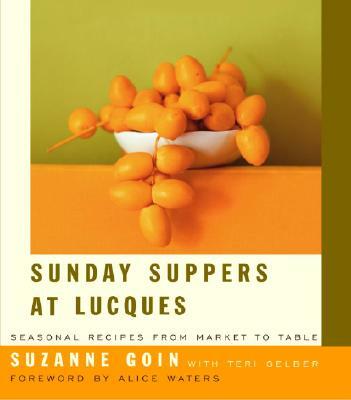 Now, in her long-awaited cookbook, Sunday Suppers at Lucques, Goin offers the general public, for the first time, the menus that have made her famous. With this book, Goin gives readers a sublime collection of destined-to-be-classic recipes. More than that, however, she offers advice on how home cooks can truly enjoy the process of cooking and make that process their own. One Sunday with Suzanne Goin is guaranteed to change your approach to cooking–not to mention transform your results in the kitchen.